I like to think that my palate has changed a bit since my early 20’s. Call me a hipster if you want, but these days if I’m having a beer I prefer something with a lot of flavor. A stout, a porter, even an IPA or two. That said, if it’s the Fourth of July and I’m looking at an all-day drinkfest as I float around a lake on a boat, I’m probably just going to bring a case of Coors Light. Taste the Rockies! If you’re like us, you can’t wait until spring to get the 2019 fantasy baseball season started. Well, you don’t have to. Leagues are already forming at Fantrax.com, so head on over and get your league started today. When it comes to fantasy baseball, I prefer to taste the Rockies on the offensive side. Pitching? Not so much. Yes, I know I’m not winning any Pulitzers by telling you that Coors Field is bad for pitching. Still, just for context, look at these super pretty park factor comparisons from Swish Analytics I just found! Man, Minute Maid Park is weird. 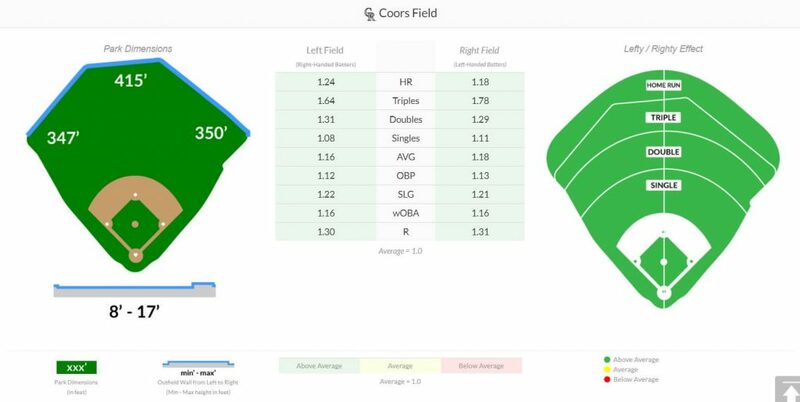 I used it for comparison just because its own park factors might surprise some of you who think it’s more of a hitter-friendly ballpark. Seriously though, look at that center field! Remember when it had that random hill out there? Let’s watch Carlos Beltran make a crazy catch climbing a hill 430 feet from home plate. Good times. Anyway, the point I was originally making is that there is a clear reason we avoid pitchers in Coors Field. At this point, I would turn this post into a love post for German Marquez, but Anthony already covered him extensively here. So, instead, I’ll turn this into a Kyle Freeland post. Is it a love post? Or is it hate? Continue scrolling down for answers! 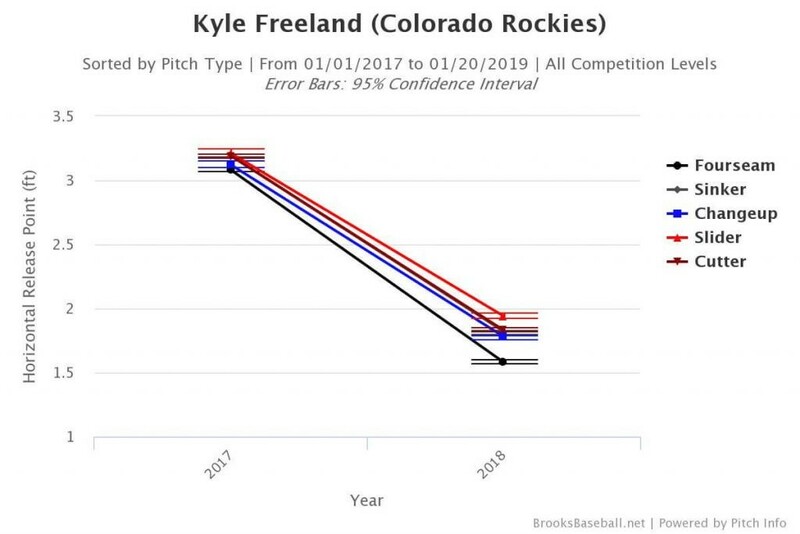 Kyle Freeland was about as far as you can get from standard mixed league fantasy radars during the 2018 draft season. His 2017 debut was rocky (pardon the pun) at best, as he posted a 6.17 K/9, 3.63 BB/9, 4.10 ERA, and 1.49 WHIP. His peripherals were even worse, with his SIERA, in particular, estimating him at a true talent 4.93 ERA. Just another Rockies starter to avoid, right? Well, he surprised us with some big changes in 2018. 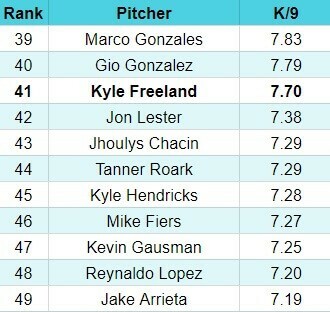 Freeland altered his pitching mechanics pretty drastically. He added a hesitation at the top of his leg lift like many pitchers do in Japan and Korea. He altered his release point as well, and it was a big change. The new mechanics allowed him to be more consistent with that release point and hit his spots with far more consistency. His first-pitch strike rate increased from 54.8% to 62.3%, tying him for 29th best in MLB alongside David Price. Better yet, he was able to be more effective by pitching in the zone less. Instead, he got more reaches outside of the strike zone, increasing from a very low 26% O-swing% to 30.7%. He also altered his pitch mix a bit, opting to throw his two-seam fastball – which sat at just 91.6 MPH – quite a bit less. He reduced its usage by 19%, instead opting to throw more four-seams, cutters, and changeups. His combined improvement in strikeouts and walks nearly doubled his K-BB%, from a hilariously bad 6.4% to a more respectable 12.2% in 2018. He was also one of just 13 pitchers to eclipse 200 innings. In points leagues where you are rewarded for sheer innings totals, that’s money. While all these improvements are pretty remarkable and led to a terrific 2018 season, how much can we expect moving forward? 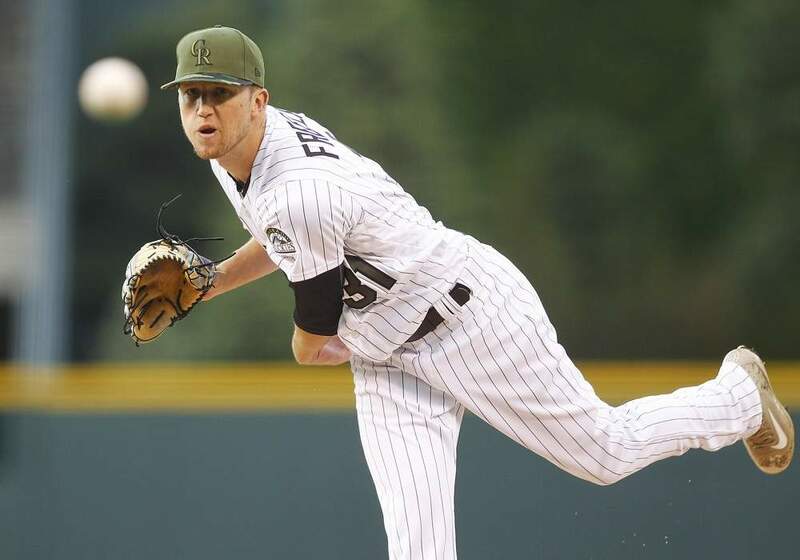 After all, Kyle Freeland already wound up in Doug Anderson’s Pitching Busts list. Well, I’m with Doug. There is some real downside here. First, that strikeout rate. While it improved, it’s still not good. His 7.70 K/9 was good for just 41st among qualified starters in 2018. Look at some of the company he keeps. You’re not looking at any powerhouses here. 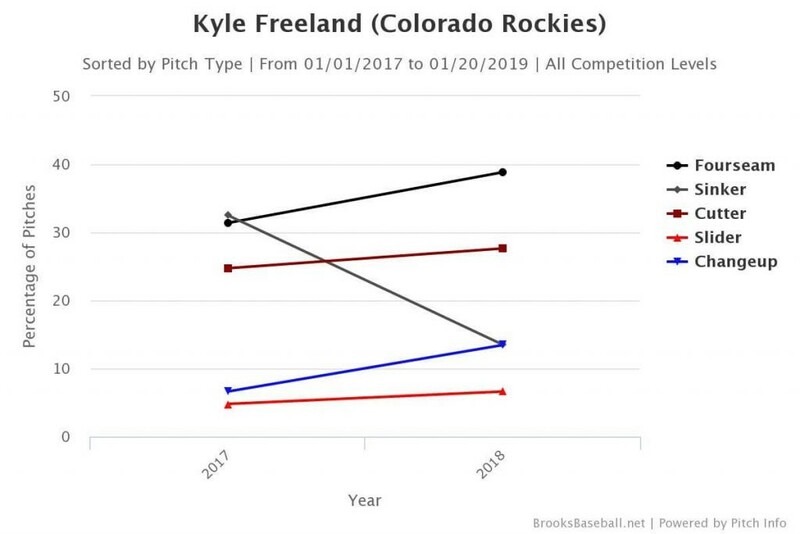 Of course, the reason Kyle Freeland is being drafted earlier than the rest of that lot is due to his shiny 2.85 ERA from 2018. There is even more to fear in terms of regression in that regard. He managed a .285 BABIP despite pitching 93.2 of his innings at the most BABIP-friendly ballpark in baseball. His BABIP was actually higher on the road (.299) than it was at home (.269). That is going to be hard to repeat considering he didn’t induce an extreme amount of pop-ups (11.4%) or soft contact (31.6%). He will also struggle to strand 82.8% of baserunners. That is roughly 10% higher than the league average. If you have an elite strikeout rate and walk a lot of batters like, say, Robbie Ray, then maybe you can count on an elevated strand rate. Freeland is not that type of pitcher. His strand rate was 90.3% at home! Hello regression, thine name is Freeland. All of this builds into his 3.67 FIP/4.22 xFIP/4.93 SIERA. Freeland is going off the board as SP39 right now, 144 overall, according to our own Fantrax ADP. That is simply one of the worst values I can find so far this year. Projection models (that I don’t disagree with) have him posting around a 4.10-4.26 ERA with a 7.50 K/9. Unless you’re in a points league where his innings are important, that is just as mediocre a line as you can dream up. The league average ERA is 4.15, and the league average K/9 is 8.5, for reference. Of course, no projection system is perfect, but this just puts into perspective what you’re investing in with your 144th overall pick. 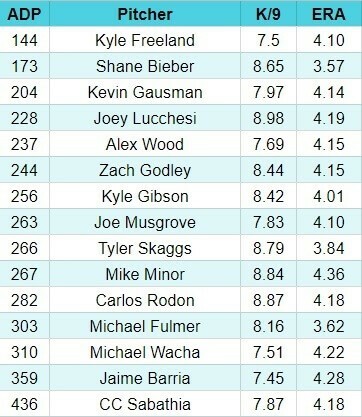 Skip Kyle Freeland at his current ADP and find someone just as good much, much later. Nathan Dokken is a member of the FSWA and has been featured on numerous radio shows, podcasts, and magazines. He is the host of the Nasty Cast and Fantrax Dynasty Baseball podcasts, and his written work can be found at Razzball and Fantrax HQ. He is on Twitter @NathanDokken. Enjoying these 2019 NL-Only Starting Pitcher Rankings? For more great rankings, strategy, and analysis check out the 2019 FantraxHQ Fantasy Baseball Draft Kit. We’ll be adding more content from now right up until Opening Day!